Lord, today we join the nation of Guatemala in their time of mourning. We grieve those who have already been lost, and we grieve the lost yet to be discovered. Lord, we pray for emergency workers as they seek the injured and trapped. Please protect not only the workers' bodies, but also their minds and spirits as they work in such surreal and tragic conditions. Help them persevere in the midst of devastation. Give them success in rescuing people in peril. 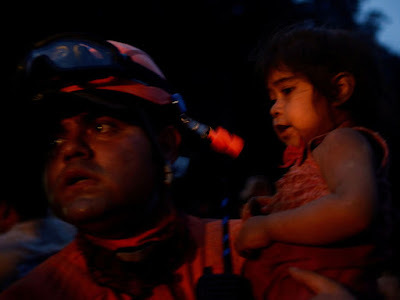 We pray for those in peril, that they would hold onto life, strength and courage as long as possible. Give them clear minds to do whatever they can do to reach safety or prolong their lives for rescue. Lord, we pray for the injured, who are so many. May they receive the medical care they need within an efficient timeframe. Provide for their financial needs in the process, through either generous health care providers or the means to receive the care they need. We are thankful for the temporary shelters that have been set up so quickly. May those locations be places of refuge and comfort, rather than fear and conflict. Send volunteers to meet needs and share hope. We pray about the airport. While cleaning and opening it may not seem crucial, we know there are volunteers who are ready to fly in to help during this crisis. We pray for loved ones who have been separated in the midst of this natural disaster. Grant them the peace that passes understanding as they await the time they can be reunited. Give them resourcefulness in finding each other. Heavenly Father, we know Guatemala has a long road to recovery. May we continue to pray for this nation in the weeks and months to come. In Jesus’ name we pray, amen.